Anderson’s project is supported by a 2019 Undergraduate Research Grant awarded by the Kentucky Academy of Science to Dr. Matthew Shake, associate professor of Psychological Sciences, for Bingocize: A Novel Mobile Application to Help Improve Older Adult Health in Underserved Areas. Anderson will be conducting cognitive tests on participants in the Bingocize® clinical trial, an NIH-sponsored research study investigating the benefits of an app-based exercise program for older adults’ cognitive and physical health. The Bingocize® program combines a bingo-like game with exercise and health education. The unique addition of bingo addresses many of the barriers to older adults’ participation because the game is fun, familiar, and done in a group setting. The program has been shown to increase older adults’ functional fitness, health knowledge and social engagement in a variety of settings. Dr. Shake notes that the Bingocize® project is important because Kentucky’s population is aging with the Census Bureau estimating that nearly 25 percent of Kentuckians will be over age 60 by 2030. Additionally, Kentucky ranks poorly in most health demographics with 40 percent of older Kentuckians doing zero physical activity over the last 30 days, and both physical and cognitive outcomes are poor. Research indicates that physical activity can induce positive changes in both cognition and physical health, but most older adults are resistant to doing it, Dr. Shake noted. 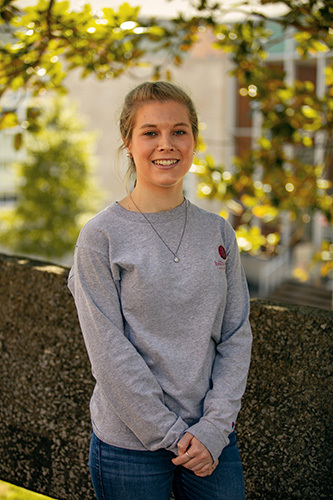 Anderson, a Psychological Sciences major, will start the Joint Undergraduate Master’s Program at WKU next fall and has a goal to obtain a doctoral degree in clinical psychology. “I’ve always been interested in how the brain works. I like doing research on it,” she said.